As an entrepreneur, success is always the goal. Whether you’re starting an online jewelry business or opening your own flooring wholesaler franchise like ProSource®, your eyes are on the prize. That being said, most businesses will fail. So how do you set yourself apart as one of the few who will truly succeed? The truth is, people who are successful in business are not any different from you. They desired success and they achieved it. You want it, so all you have left to do is go after it. When it comes down to it, every person who has been successful in business (and really, any area of life) did so in three simple steps. First things first, to get where you want to go, you have to know where that is. You wouldn’t set out on a road trip without a destination in mind. Success is the end you wish to get to, so create a clear picture of what that means. Successful entrepreneurs don’t just say, “I want to be successful,” and expect their businesses to just magically get there. If you don’t know what success means to you, how do you know you achieved it? First, as a business, you establish your value. Second, you find people who need this value: customers. Third, you establish credibility by consistently providing this value. Fourth, you create systems to ensure that you can continually deliver this value. Finally, you make a profit because of the efforts listed above. This demonstrates why profitability should not be the goal, but utility. Utility is the value you are providing to your customers with your service. Ask yourself: what is my business? What change am I trying to create? Next, after you know where you want to go, you have to figure out how to get there. The journey of success involves preparation. Entrepreneurs who have success first desire it, and then they focus on learning how to get there. Regardless of what area of your life you are looking for success in, there is already an established process on how to achieve it. 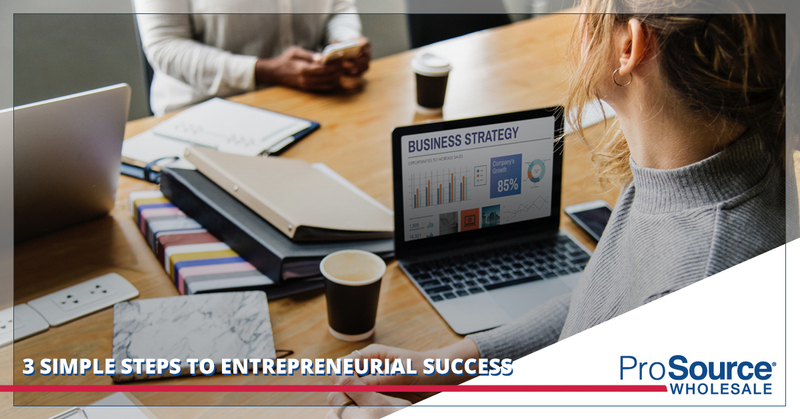 The commitment to discovering what it takes to succeed in your particular arena is the main difference between successful and unsuccessful entrepreneurs. The key word here is “commitment,” which can be difficult for some who are looking for a way to get rich quick. The truth is, if you want to be successful over the long-term, you cannot create it overnight. You have to invest in education. This doesn’t necessarily mean attending business school, though this can be a great place to start. It means learning your market inside and out. It means becoming intimately familiar with what success requires before you achieve it. Successful entrepreneurs take the time to master the process of success in business. That being said, all your learning will be all for naught if you don’t put in the work. It doesn’t matter if you know exactly where you want to go if you never take the first step. If you want to succeed, you must act. Successful entrepreneurs set their eye on their ambition, learn everything they can about how to get there, and then hustle. All the dreaming and studying in the world won’t help you if you don’t execute. Doing the work is what translates your vision from a far off dream into your current reality. At ProSource, we have been able to demonstrate our value again and again by creating a system through our franchising opportunity. If success is your goal, we have a proven process to achieve it. With the support of many successful entrepreneurs and a business model that provides undeniable value to trade pros, we are the flooring wholesaler franchise that embodies success. If you are looking for the best franchise opportunity for you, we are interested in finding out whether or not it would be a good match. Contact ProSource today to learn more.